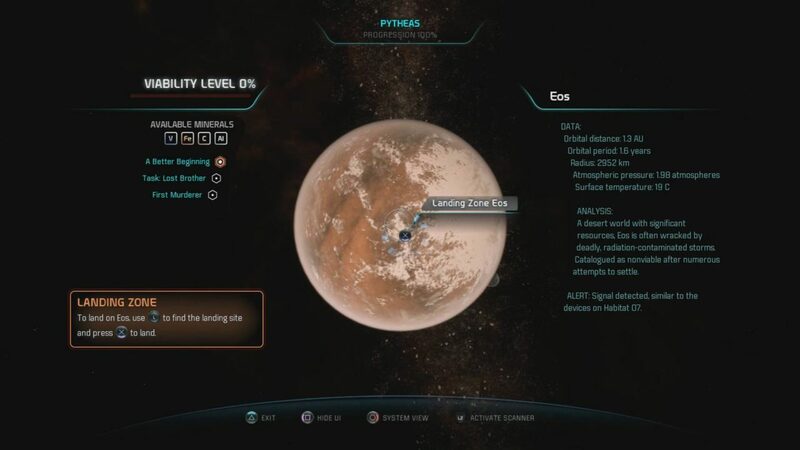 This is a Mass Effect Andromeda planet locations guide on the planet, Eos. Here, you will learn details about the planet’s climate, wildlife, and indigenous species. We will be updating this as more information comes out. Pictured: the planet and its landing zone. A desert world with significant resources, Eos is often wracked by deadly, radiation-contaminated storms. Catalogued as nonviable after numerous attempts to settle. Eos, designed habitat 1, was the earliest “golden world” identified for outpost placement. Named for the Greek goddess of dawn by Jien Garson personally, Eos embodied the hope of the Andromeda initiative for a new start. On arrival, the Nexus discovered that a world projected to be arid but comfortably habitable was now ravaged by radioactive fallout from the Scourge. The planet’s atmosphere is wracked by storms that have spread the radiation across continents; periodic 130km/hr winds strip equipment and damage shuttles. Reports from the Nexus include a sanitized account of two attempts to colonize the planet, both of which ended in failure and an unacceptable loss of life. There is also a significant kett presence on Eos, apparently investigating mysterious signals on the surface. The planet is now off-limits to unauthorized Nexus personnel, as the Nexus leadership believe it is no longer viable. Activating the vault discovered below Eos’ surface has had a dramatic and immediate effect. Radioactive particles are being stripped from the atmosphere by unknown means, and the resulting temperature changes are calming Eos’ high winds. The planet’s moisture levels are already showing improvement. Prodromos, the first Pathfinder-established outpost, has been founded in Fairwinds Basin, with Mayor August Bradley in charge. The Nexus is broadcasting footage of departing colonists and the new conditions on Eos across all communication channels.